Are you looking for more than just a job? Do you want to work with a company that regularly promotes from within? Do you want to be part of a team that values you as a team player and develops you to be all that you can be? 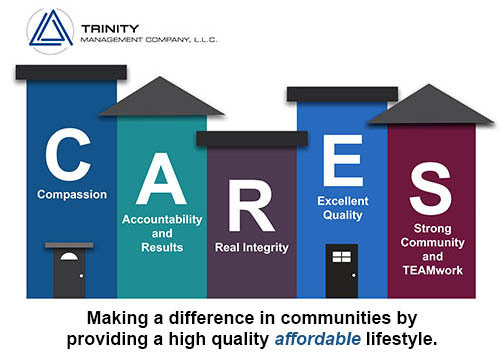 Trinity Management Company may have the exciting career path you are looking for. Our Leasing Consultants spend their days warmly greeting prospective residents, determining their needs and preferences, professionally presenting our community, and accurately completing all lease applications. Trinity Management Company is a successful Arizona-based property-management team of professionals. To make certain that our residents receive the best service possible, we exhaustively evaluate and train our entire management team for optimal success. We take great pride in our communities and we believe that servicing our customers starts from the moment a guest walks onto one of our properties and continues long after our residents turn in their keys. Understanding that the residents of our communities are our greatest ambassadors led to our guiding principles and accompanying behavior. Trinity Management maintains a constant focus on improvement to always do better than the day before. We attract and keep the most talented management team by offering attractive performance-based compensation, as well as continuous education to ensure that our staff are skilled business operators, lessors and maintenance supervisors.